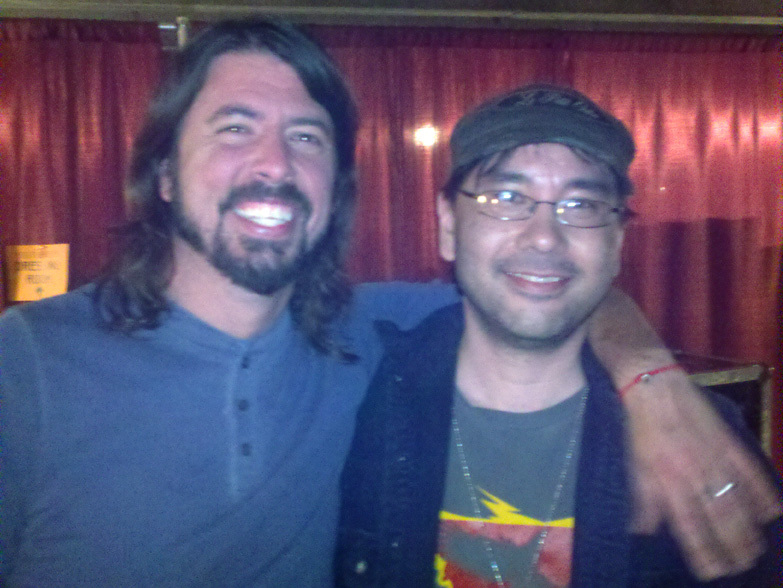 Dave Grohl: “So want to do a shot of whiskey?”.. hell yeah! Last night has to go down as one of the coolest and funnest nights I had in a long long time! 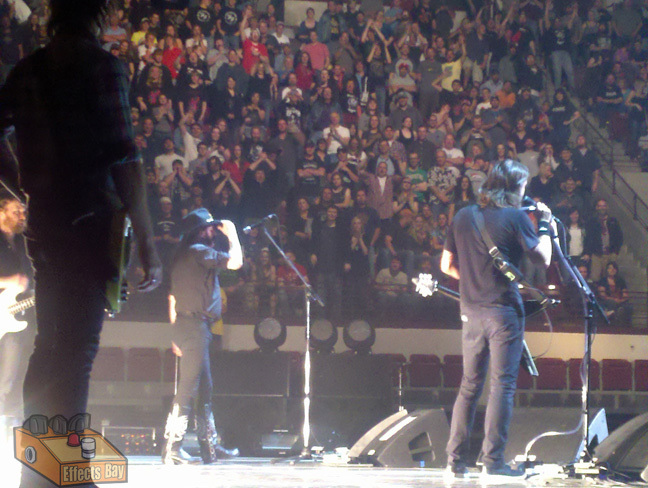 Foo Fighters came to town and through a mutual friend, I was able go back stage, hang with the band and watch a truly amazing show. The opportunity to meet the band was an incredible experience. I have to say that group of guys are some of the nicest and easy going people I met. They are rock stars that do not act like what you might preconceive what a rock star would act like. At one point, Dave looked at me and asked if I wanted a shot of whiskey. Um…. yeah! So how the hell did I get to meet these guys? Basically, I’m friends with the owner/operator of Wire Instruments in Seattle and he was dropping off a surprise bass present for Nate Mendel. 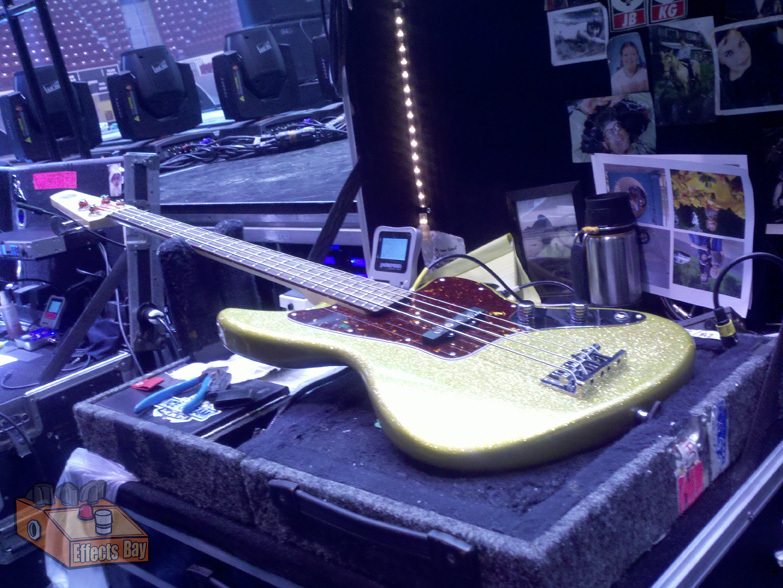 Below is a shot of this beautiful custom bass on the bass tech’s bench at sound check. 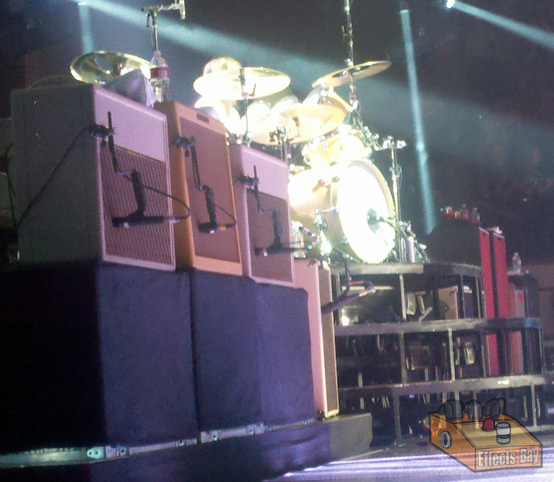 While sitting on stage right, it was great to see Nate actually use it in the set. Here is that shot of him posing with the new Wire Instruments bass! The set was amazing! Foo Fighters played for 3 hours straight! Energy level was crazy high, and they were humming on all cylinders. Before the show, I had a chance to join in on a conversation about necks, pickups and guitars with Chris Shiflett, unfortunately he had to get ready for the show before we could talk about effects. I did have a few words with Nate about effects though. He mentioned that he does use a Fulltone Bass drive for some overdrive parts, but since he’s dealing with a 5 piece band, that playing straight is often the best choice tonally for the band. Well, hell.. this is suppose to be a post about effects. I did tweet that I did get some pedal shots… well… I DID! I guess I’ll want to talk about Chris’ board first. I was surprised to see that it was trimmed down (sorta). Originally I had some shots from 3/24/2011, but it looks like he’s changed things around. 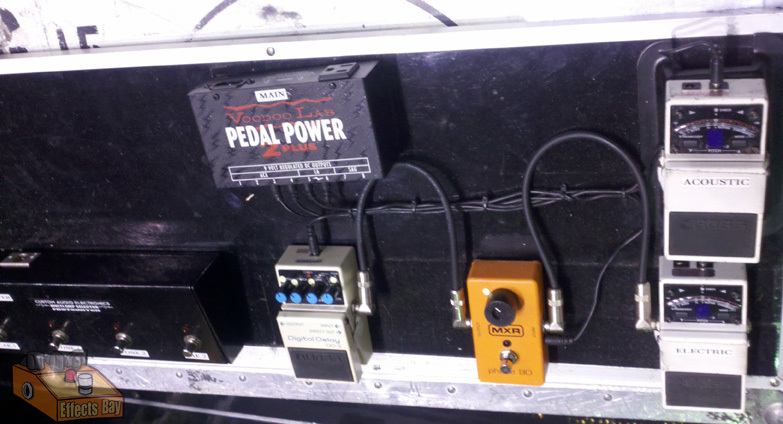 Originally he was using multiple Line 6 modeler pedals (DL4 and MM4). He’s definitely consolidated with a Line6 M13 stompbox modeler. That took care of the dual DL4s and MM4 from before as well as allowing him to remove the EHX holy grail and Menatone Red Snapper from the new line up. He’s still using the EHX Micro POG, Fulltone Full-Drive 2 MOSFET, Boss TU-3 and Dunlop DVP1 Volume Pedal. I’m assuming the little custom black pedal is a input selector/jumper switch. It’s different that what as there in the past.. but very similar. 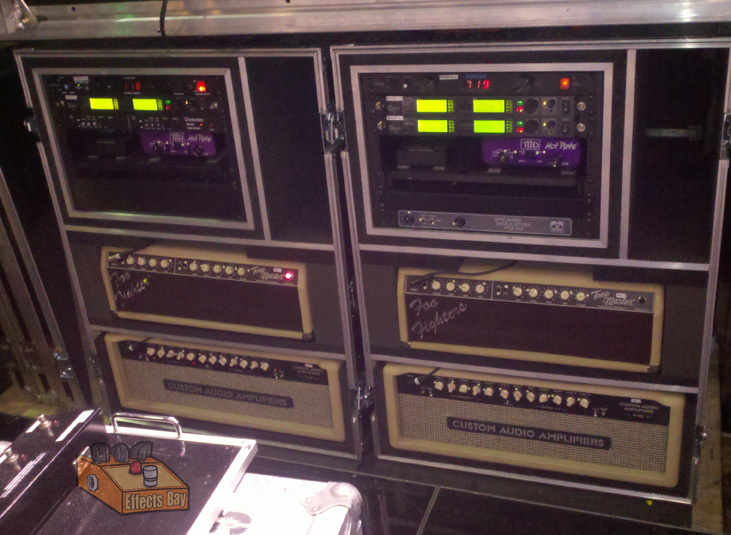 He is also using a Voodoo Lab Amp Selector for switching amps. 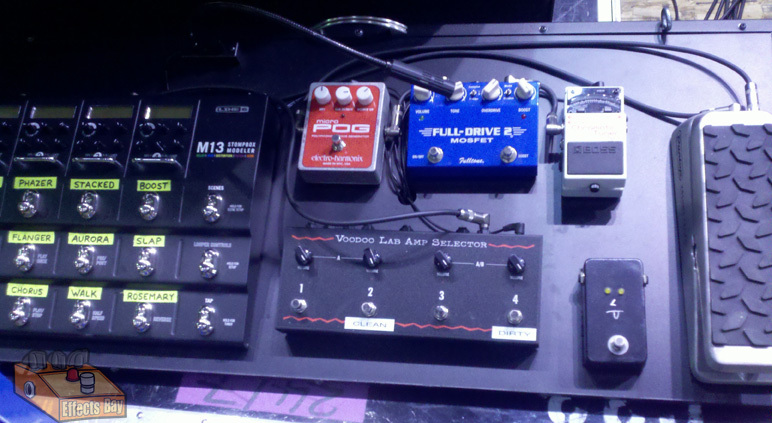 Dave Grohl’s board appears to be pretty consistent with older shots. A pair of Boss TU-3 tuners (one for electric the other for acoustic). Boss DD-3 delay and MXR Phase 90. The black box is a CAE amp selector. Pedals powered by Voodoo Lab Pedal Power 2+. Additionally, he was using a Jim Dunlop HT1 Heil Talk Box as well. 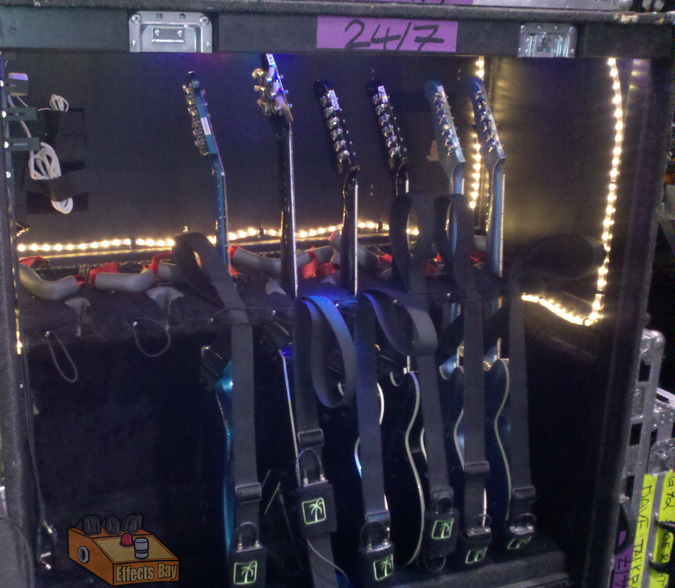 Here is a shot of Dave Grohl’s guitars and amps. I’m pretty bummed I wasn’t able to get Pat’s board though. I’ll see what I can dig up and follow up with a Pat gear post to make up for it here. Damn. Like I mentioned the show was stellar. I really liked how they “entertained” the audience. It was definitely a performance for the crowd, and you really got a sense of connection. The crowd was into Dave stating they were going to play until the crowd asked them to stop. 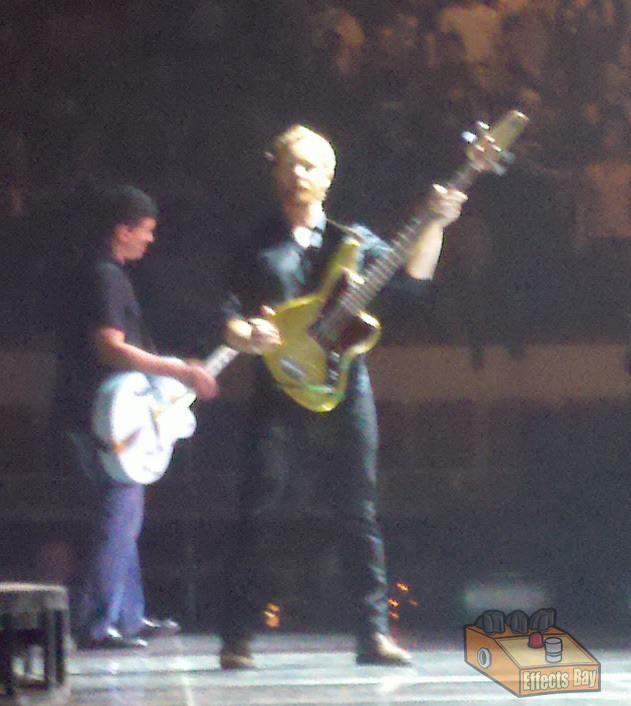 The Foo Fighter set list had 26 songs on it. 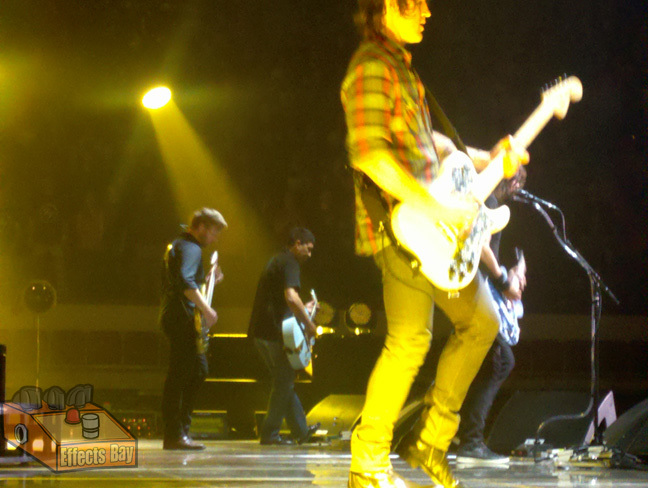 They played close (if not) 10 songs during the encore and the crowd was loving every second of it. It’s been a very long time since I saw a production show of this level, and it’s amazing the bodies it takes to make it happen. Stacks and stacks of road cases. Miles of cable. It was mind boggling. Also, Motorhead opened. I can’t believe that I waited this long in the post to mention that. M-o-t-o-r-h-e-a-d people. Lemmy at one point join the band for a song, and the crowd went wild. After the show my backstage experience continued. Most of the guys left for the next city, but Dave and Pat stuck around and we ended up closing a local bar. Lemmy decided to show up as well. 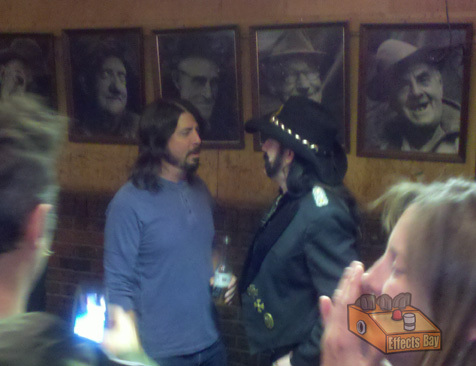 So here is Dave and Lemmy in a local bar in town. Surreal experience to say the least. I must mention that there were a few local regulars there at the bar, and all wanted to talk with Dave and Lemmy and it was so cool to see them talk to everyone. These guys are the real deal and just enjoy hanging out and living. The night ended safely and I went home late, but the experience is something I’ll be looking back fondly for a long time. 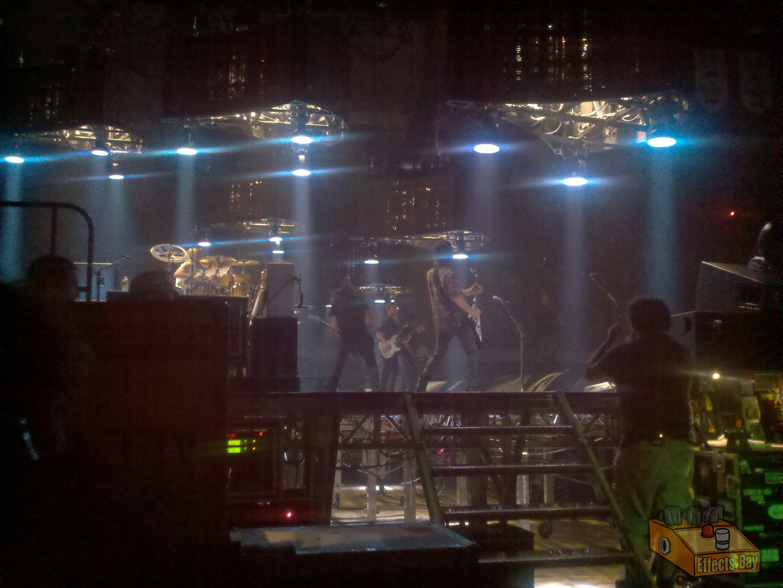 If you get a chance to check out Foo Fighters.. please do, the show will blow your mind. Dave Grohl – Fresh Pots! So cool!! Thanks for posting. I could stare at pictures of pedalboards and gear for hours, so loved checking out Chris and Dave’s.